I first got deeply involved with the Isuzu D-Max (known at the Isuzu Rodeo in the UK) through my family. 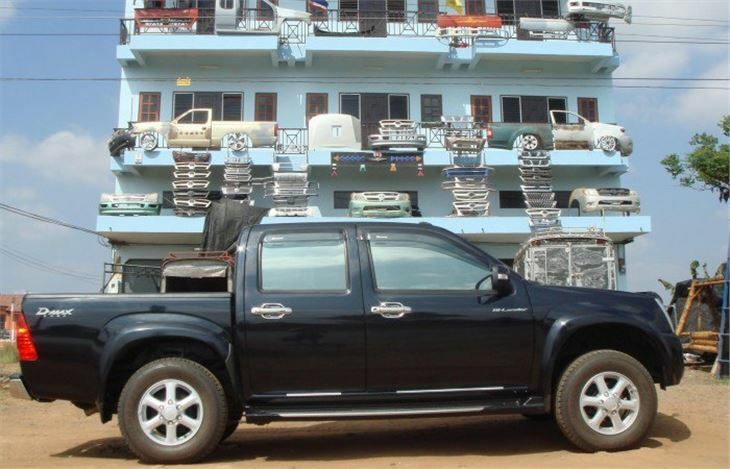 What do you do when your wife hocks the car you bought her to buy her dad a new pick-up he doesn’t need? Divorce springs to mind. Because this comfy family arrangement you will eventually pay for means that the used pick-up you bought her father two years ago has now passed to her brother. However, divorce, in this case, could prove even more expensive than buying two motorbikes, a car and two pick-ups. So better to let the little wife (and business partner) pay for her latest acquisition out of her allowance, and make that new pick-up the subject of a road-test. Papa’s truck is the latest generation D-Max Hi-Lander with Isuzu’s I-TEQ chain driven twin-cam 16v 2.5 diesel that pumps out 136PS at 3,600rpm and 217 lb ft torque at 1,800rpm. It’s apparently a very good tower, emits only 213g/km CO2 so is under the 225g/km ‘nasty’ limit and what Thai farmers really like is that it’s chain cam. 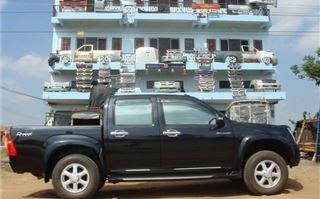 They’ll point proudly at the chain case and use sign language to show there can be no disastrous loss of belt, as can happen with a HiLux Vigo or an L200 Triton 2.5. They may also mention the rear axle snorkel that gives their trucks a decent wading depth without the diffs filling with water as is the case with a certain other make and model. Papa really loves his truck. It’s directly costing me all of £12,000, plus interest. 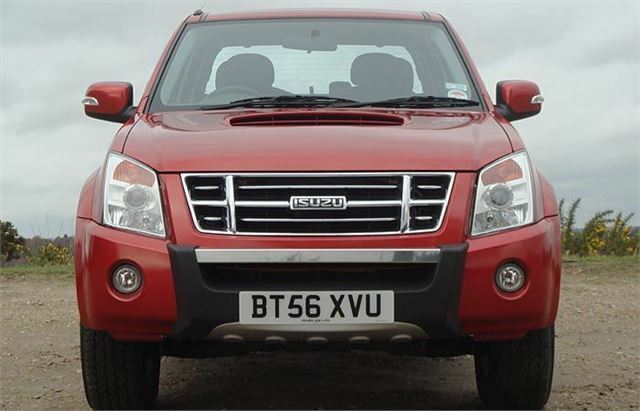 But, though a high stance ‘Hi-Lander’, it isn’t four-wheel drive. 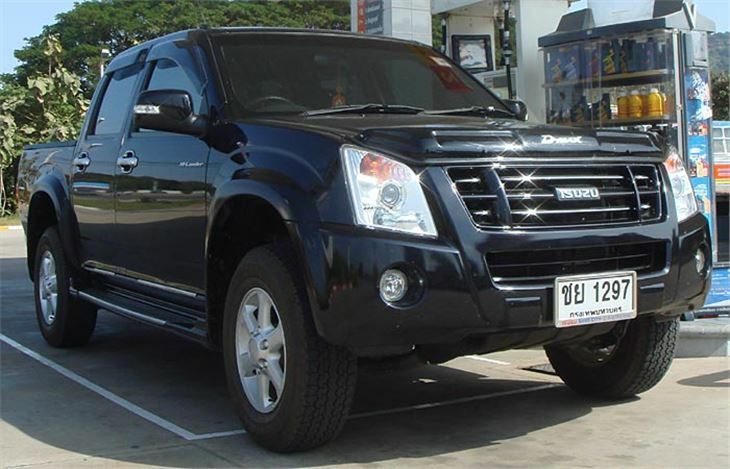 An extra driven axle is seen as a bit of a burden in Thailand where pick-ups typically cover 50,000 miles a year and the extra drag of four wheel drive means more fuel consumed. A Thai farmer may be driving a £12,000 pick-up, but he’s lucky to earn more than £500 a month so the cost of diesel now at around 30p a litre really counts. I got to ride in it on a previous visit and soon discovered that the back seat can be curiously more comfortable than the front seats. That’s because, as a front seat passenger it’s courteous to move your seat as far forward as possible to give more room to the inevitable four or five people in the back. Also, when sitting behind the driver, you can often see things before he does, which might save your life. From the driver’s seat it’s a different matter. There’s no lumbar support and the lever you think will provide some actually releases the backrest. But you sink softly into the seat and it’s not bad. At this stage I’m going to revert to the cherry red metallic four wheel drive Rodeo Denver I borrowed from Isuzu UK for some UK driving impressions. It’s a big beast, 16’ 6” long. And this one had an antisocial fixed towbar on the back, sticking out another 6”. Also, compared to the latest cars and 4x4s I usually drive, it’s remarkably old fashioned. Garish double-DIN Clarion radio CD player, hap-hazardly placed switches, no satnav, no cruise control. And don’t believe that old myth that the side of the fuel gauge the petrol pump icon is on will correspond with the filler on the truck. Not on mine, it didn’t. (The fuel filler release is on the floor next to the driver’s seat, by the way.) Yet, over an admittedly very unscientific 106.4 miles, it appeared to have averaged 34.77mpg, which isn’t bad at all. And mine was dragging along that extra diff and transfer case. I even chanced what should have been its worst environment: the Surrey school run. Actually, mine was a champagne run for the workers, but at the same time as the QE7s, X5s, GLs, XC90s and all the other battle wagons that come out to pick up the next generation of city brokers and bankers from their posh fee-paying schools, mothers chatting incessantly into their Motorola Razors and i-phones as they charge down the rat-runs through the council estate, anti-hijack locks applied. My Rodeo coped with this perfectly. It gripped very well on the roundabouts, trundled pleasantly through Hersham at 25mph (schoolkids on the sidewalk) slotted neatly into Laithwaites carpark. One small problem: the back seat squabs don’t fold up like they do on a Navara. But the champagne didn’t fall off. 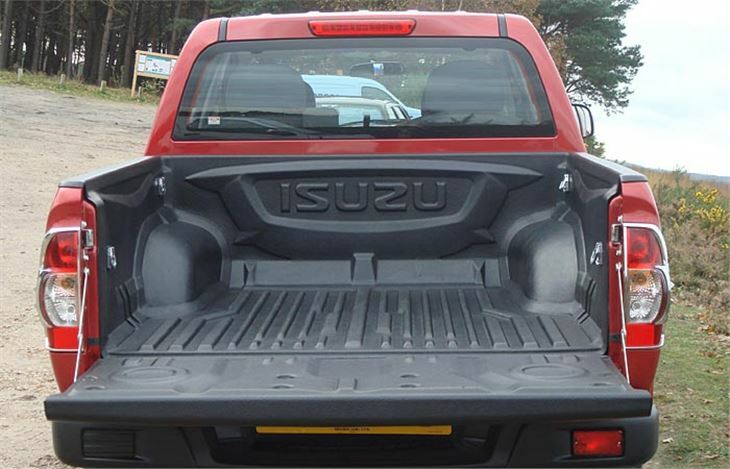 If it’s a choice between a comfortable back seat and one that folds out of the way, give me comfort every time, and it is much more comfortable than a Navara’s. That’s enough of the UK test. I’ll continue this in Thailand. It turned out that Papa’s D-Max needed to go back to Bangkok for a free 6,000 kilometre service, which meant I’d get a 450 mile drive. And the builders were making remarkable progress on our house there. On top of which our Brasin bull had been putting its small herd of cows into calf very successfully, so had increased in value fourfold. As well as which all was peace, harmony and friendliness on the homestead, and in Thailand foreigners have to pay for things like that so I settled my little argument with myself. And the 2.5 I-TEQ is such an amiable engine it makes driving the D-Max a pleasure. 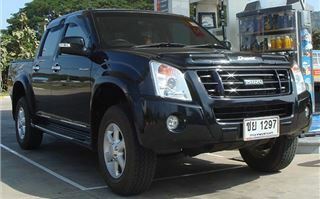 I first got to drive it from Phibun, near the Lao border, back to our village and found it really pleasant. The reason why is that same nice, flat torque curve that lets you trickle down to 1,000rpm, then pull away cleanly without protest, which is ideal for ambling along. Give it a tougher job like driving Detudom to Bangkok 450 miles and the first thing that happened is we got stopped for speeding. Amazingly my lovely Thai wife managed to face down the cop by insisting that the limit was 120kmh, not 90, that he’d let the car in front go, which had been travelling the same speed as us, and if he wanted to argue let’s go to the police station were her uncle was a senior officer. We were soon on our way again (and actually passed a lone 90 sign). Highway 24 involves a lot of overtaking in the 60 – 80mph speed range and for most of this I could simply leave it in top. 5th corresponded to about 30mph per 1,000rpm, so 100kmh was about 2,000rpm, and we were cruising economically at 2,000 – 2,500rpm. We did pull 3,000 on a stretch of dual carriageway so, as with the 4WD Rodeo in the UK, 110 – 115 is probably on the cards if you really want to go there. And, being New Years Eve, there was quite a lot of traffic and cops about. We counted around 100 road blocks, unmanned in the daytime but likely to be very active in the evening as Thailand starts to get tough on drunk drivers. This year’s Thai commercial against drink-driving shows a car drunkenly slaloming through a course made up of cardboard cut-outs of people, it hits two and as it pulls off the screen, the two cut-outs turn into dead people. The driving always gets more demanding from Sikkhiu interchange where Highway 24 joins the main Highway 2 from Nakhon Ratchasima to Bangkok. It’s mostly three lanes either way, sometimes four lanes, but the speed of each lane can vary considerably and, while Thais don’t deliberately try to enforce any speed limits by holding other drivers up, lane discipline doesn’t exist. That means that something in the outer lane can be doing 60 or less with nothing in front of it, so the quicker Thai drivers do what Thai drivers do best, “driving with Buddha”. They use their mirrors and pass anywhere there is space to pass, and sometimes where there isn’t really space to pass. A D-Max is a fairly intimidating vehicle, but not against thousands of other D-Maxes, Hi-Lux Vigos and Fortuners. On the other hand it doesn’t handle as well as our little Toyota Vios. And here, please may I make a plea for all car and truck manufacturers to give their side mirrors the same magnification as their interior mirrors. Without driving in the least aggressively, or endangering anyone, we threaded our way through the traffic down the mountain to Saraburi and on to Bangkok, doing the journey in six and a half hours including two comfort stops, a photo stop at pick-up parts and one to pick up the debris from an aftermarket window rainshield that unstuck and blew off. A brim to brim consumption check for 191 miles of the journey showed 36.45 mpg, slightly better than the UK four-wheel-drive Rodeo, but also consistently mid 30s, which is very good for a big pick-up truck. What’s more, back in Bangkok, we both stepped out fresh as a couple of daisies, physically and mentally. 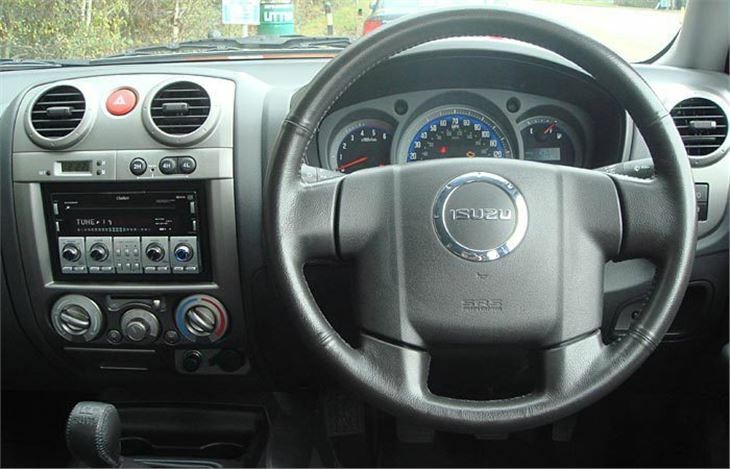 Partly due to the comfort of the seats and partly the relaxed amiability of the engine. 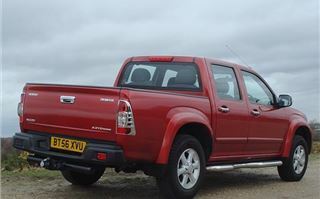 There’s no need to seek more bhp if you’re buying a pick-up, because that usually means less torque at low revs. 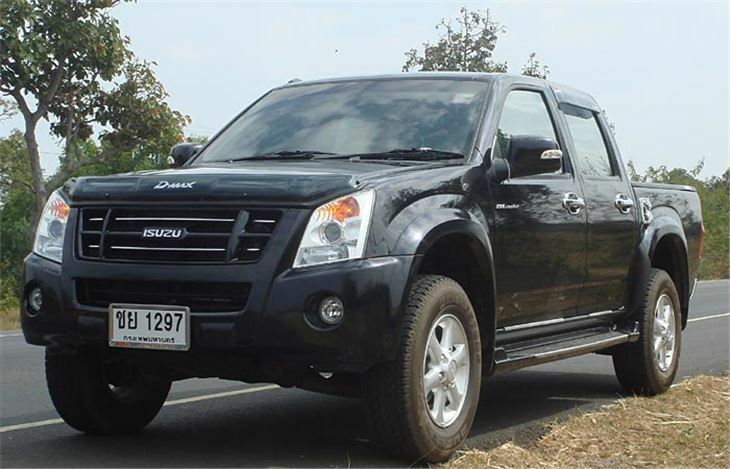 And Isuzu has got it exactly right with the I-TEQ 2.5. While I was in the village I got wind of another ‘farang’ building a house with his Thai wife not far from ours. I never found the building site, but I did see him getting into a brand new black Isuzu D-Max Hi-Lander.